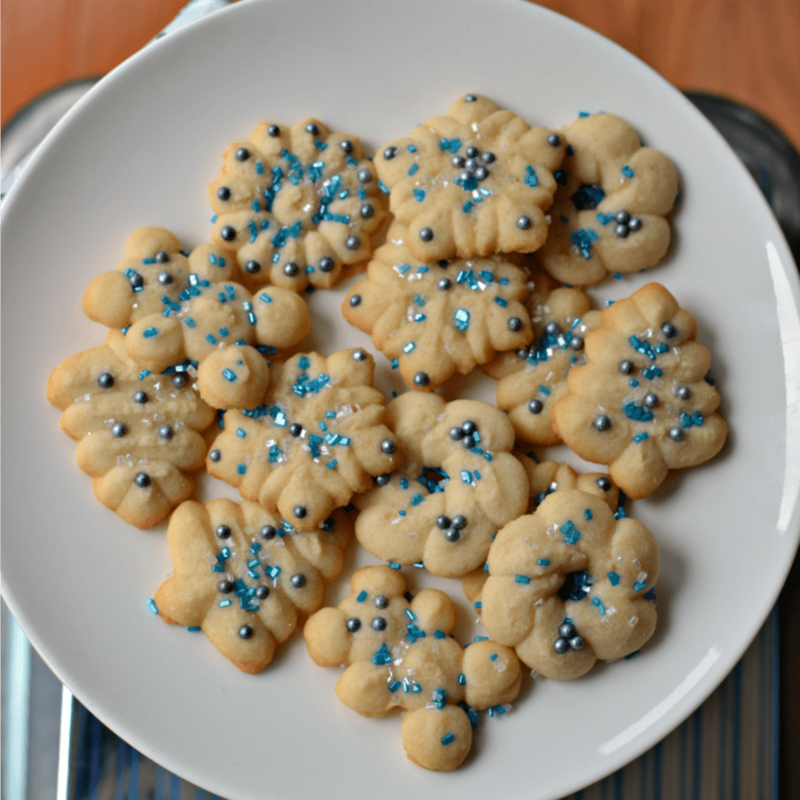 Shortbread Cookie Recipe makes delicious rich buttery cookies. This recipe can be feed through a cookie press, cut with cookie cutters or bake and slice. They are perfect for your holiday trays and tins. Buttery Pecan Snowball Cookies and Soft Gingerbread Cookies make delicious additions for your holiday baking as well. 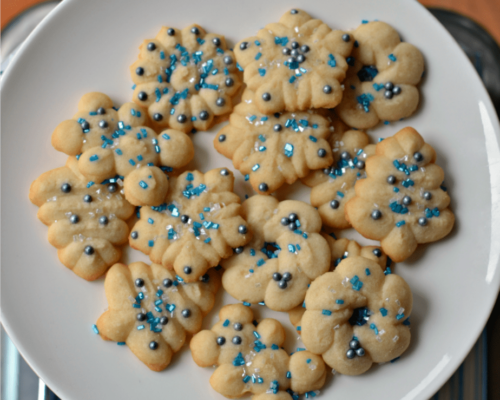 I have always loved this Shortbread cookie recipe. They are one of my absolute favorites. Classic melt in your mouth buttery cookies with slightly crispy edges. Shortbread cookies are made with fat, sugar, flour and whatever flavoring you like such as vanilla, almond and even orange extract. Shortbread cookies do not have eggs in them. If you added eggs to this recipe you would not get the crumbly crisp buttery classic taste of a shortbread cookie. Do you like shortbread cookies? How to make Shortbread Cookies. This four ingredient cookie recipe could not be any easier. First cream butter and powdered sugar until light and fluffy. Then turn the mixer to stir and add the vanilla. After the vanilla is incorporated stir in the flour and mix well. Make sure you scrape down the bowl and beater so everything is mixed in well. After making the dough chill it for about 30-40 minutes. Then load it into a cookie press and drop cookies onto cookie sheets covered with silicone mats or parchment paper. If desired decorate with sprinkles and pearls. Bake for 10-11 minutes. Can this shortbread cookie dough be rolled and cut into shapes? Yes it most certainly can. Refrigerate the dough for about an hour. Lightly flour your work surface and rolling pin. Roll the dough out to about 1/4 inch thick. Using cookie cutters cut the dough and place the cookies on to cookie sheets covered with silicone mats or parchment paper. Rework the scraps, rolling and cutting as much as possible. Bake for 10-11 minutes at the same temperature as the cookie press cookies. A cookie press is a fun little kitchen gadget that you load with cookie dough and press through different disk designs to make cookies. You can create dozens of perfectly consistent cookies effortlessly and quickly. 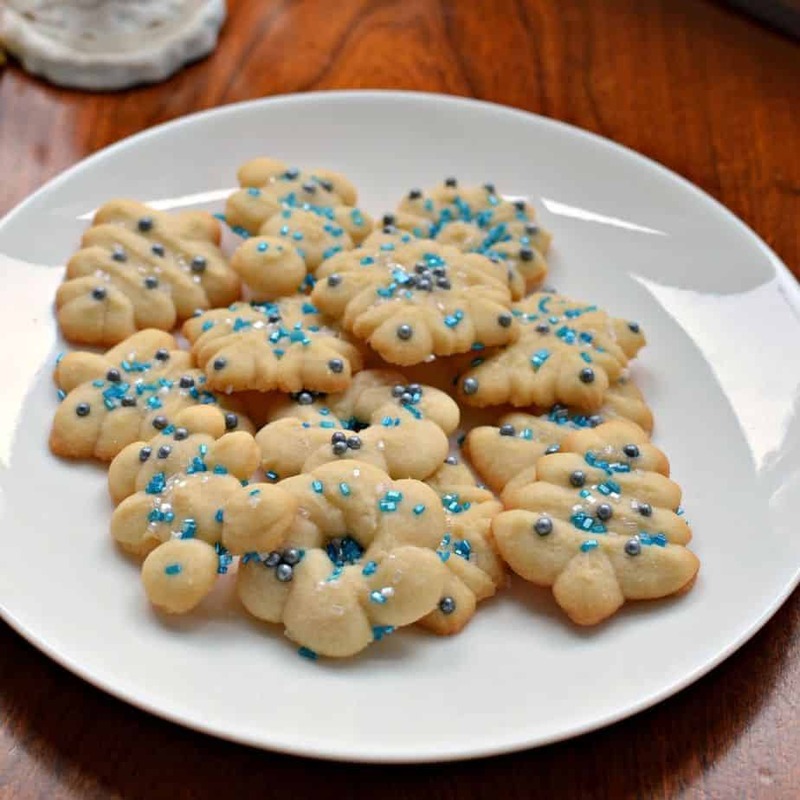 They are extremely easy to use and make the cutest little cookies in minutes. Can you shape Shortbread Cookie Dough into a log for slice and bake? Yes you most certainly can! Simply roll the dough into two small logs and wrap in plastic wrap or wax paper. Place the logs in the refrigerator for at least 3-4 hours. Remove from refrigerator and slice about every third of an inch with a good sharp knife. Place on cookie sheets covered with silicone mats or parchment paper. Bake for 10-11 minutes at the same temperature as the cookie press cookies. Helpful hints on making this Shortbread Cookie Recipe. Start with softened unsalted real butter and beat it with the powdered sugar until is light and fluffy. This can take several minutes. Use real vanilla extract. It really does make a difference. Refrigerate the dough for 30-40 minutes for cookie press cookies. 1 hour for rolled cookies and 3-4 hours for slice and bake. Refrigerate dough between batches. If decorating with sprinkles and pearls make sure you do so before cooking. Always preheat your oven and load the cookies on the middle rack if at all possible. Cover your baking sheets with silicone mats or parchment paper. If you have the time run one or two cookies on a practice run to establish optimum cooking time. Quickly remove cookies to cookie cooling racks so they do not continue to bake. Store in airtight containers for up to a week or freeze up to six weeks. How to freeze Shortbread Cookies. After baking let the cookies fully cool. Double wrap in Ziploc freezer bags (removing as much air as possible) and place in sturdy freezer containers. Place in freezer for up to two six weeks. When thawing remove from all packaging and place on serving plates in single layer until they are thawed. Once thawed they can be stacked for serving, packed in airtight containers, or packaged for gift giving. It is the condensation that builds up in the freezer bags that ruins the cookies. 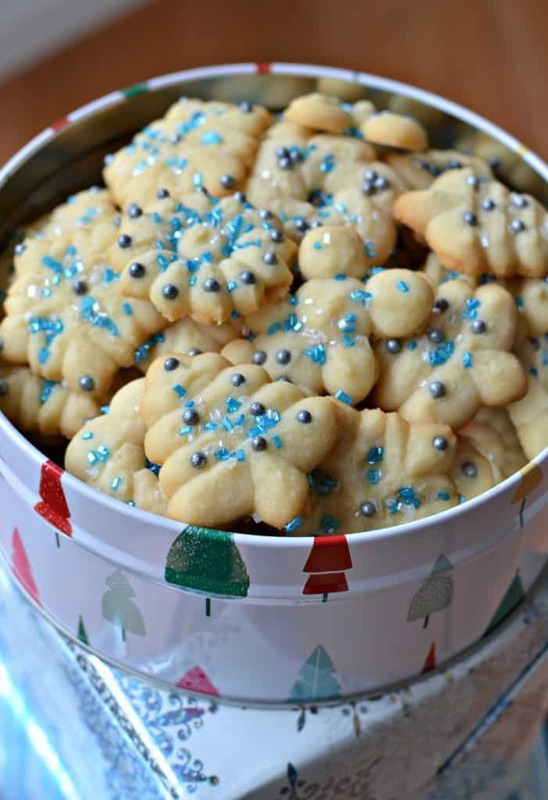 Shortbread Cookie Recipe makes delicious rich buttery cookies. This recipe can be feed through a cookie press, cut with cookie cutters or bake and slice. Cream butter and powdered sugar until light and fluffy. Turn the mixer to stir; add the vanilla and mix just until incorporated. Stir in the flour and mix well. Make sure you scrape down the bowl and beaters so everything is mixed in well. Chill the dough for 30-40 minutes. Load it into the cookie press and drop cookies onto cookie sheets covered with silicone mats or parchment paper. If desired decorate with sprinkles and pearls. Bake for 10-11 minutes. After 1-2 minutes remove cookies to cookie cooling racks. These are very petite cookies so a serving is 5 cookies.